The Heteroptera is a group of about 40,000 species of insects in the Hemiptera. They are typical bugs. "Heteroptera" is Greek for "different wings": most species have front wings with both membranous and hardened portions (called hemelytra. The name "Heteroptera" is used in two different ways in modern classifications. In Linnean nomenclature it is a suborder of the order Hemiptera. 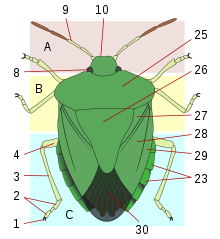 In cladistics it is an unranked clade in the Hemiptera clade. A: head; B: thorax; C: abdomen. 1: claws; 2: tarsus; 3: tibia; 4: femur; 8: compound eye; 9: antenna; 10: clypeus; 23: laterotergites; 25: pronotum; 26: scutellum; 27: clavus; 28: corium; 29: embolium; 30: membrane. 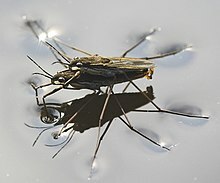 "Waterbug" is a common name for various aquatic insects. ↑ Tree of Life Web Project. 2005. Heteroptera. True bugs. Version of January 1, 2005. Retrieved July 28, 2008. This page was last changed on 10 February 2014, at 00:46.